Director Peter McGuire gave a wonderful lecture on Valentine's evening. He spoke about this labour of love— Picnic is one of his favourite plays— and the joy of truly collaborating with the students on this production. If you missed it, tune in now and listen to the audio recording of Peter's talk posted here. "Picnic is the exact type of production I love." 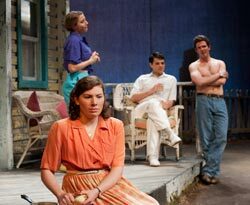 There's a lot to love about Picnic and our local reviewers are commenting on many aspects of the play. 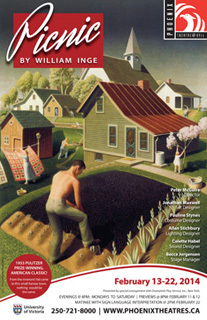 The common theme seems to be how relevant the questions asked by William Inge are to our lives today. Here's what some of them had to say. Beautiful period costumes by Pauline Stynes also highlight socio-economic differences — the luxury afforded by some, the care taken by others. 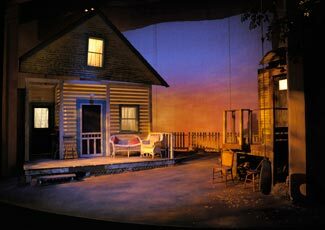 Jonathan Maxwell’s substantial and solid set design grounds this piece — it wasn’t until the very end that I realized the deconstructed nature of the houses, which serve as a powerful metaphor for the lives of the characters. One of the standout performances here is Michelle Morris’ portrayal of the single schoolteacher Rosemary. Morris manages to capture both surface and hidden emotions found in her character, whose arc is one of the most moving in the entire show... As Millie, Lindsay Curl excels at delivering the boisterous energy of a kid but also the burgeoning awareness of a precocious teenager (shown below). Picnic is definitely a strong showing for the Phoenix and the play remains a relevant and engaging piece 60 years after its debut... as a show overall it holds up to the standards of professional theatre and offers audiences a very moving story in the process." "In climactic moments of passionate demands and a fist fight, questions are asked of the characters that the audience in turn asks themselves: "What can you do with the love that you feel? Where is there you can take it?" All in all, through the play's examination of self-worth and the archetypes of the pretty one, the smart one, the rich one, and the reckless one, the audience learns what it means to break out of predetermined roles." Read more of Rachel Sovka's review from Nexus. "Picnic is the exact type of production I love. Multiple costume changes. Elaborate set. Music. A dance sequence. A fight. A make-out session. It’s nice to see UVic theatre students show off their non-acting strengths. Costume, lighting and sound were effective. Not to say the acting didn’t rise to the occasion. I’d feel bad signaling out individual actors, as they all deserve praise. ...it contains a wonderful amount of romantic comedy tropes that I’ll always enjoy: girl falls for the bad boy, girl wonders if beauty and brains can coexist, girl tries to avoid the mistakes of her mother and my favorite, a story centered around an event the audience never gets to see. 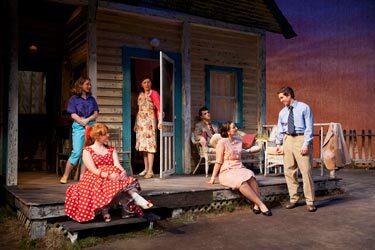 If you’re a fan of nostalgia, add Picnic to your February theatre schedule. Read more of Kaitlyn's review from The Marble. The drama's subplot... concerns Rosemary, a spinster schoolteacher (and secret good-time gal) who's desperate to get married to Howard, a reluctant shop-keeper. 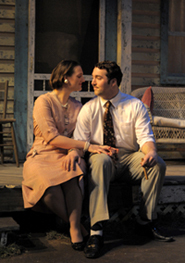 Rosemary's final plea to Howard, made after a night of carousing, is genuinely moving — and on Friday night was well-performed by Michelle Morris (shown left with Markus Spodzieja as Howard). Designer Jonathan Maxwell has created a wonderfully evocative set, dominated by a clapboard house with a weather-worn patina... A splash of visual vivacity is provided by colourful period costumes by Pauline Stynes. Other interesting articles, news stories. 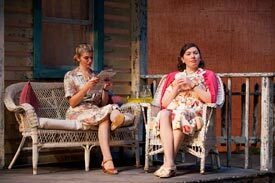 Read Monica Prendergast's Focus Magazine article about William Inge and Tennessee Williams and their portrayal of strong women. Don't you love our gorgeous photos for Picnic?! We're ever so thankful to David Lowes at Arts Studio21 Photography who always makes us look good. If you want to see more? 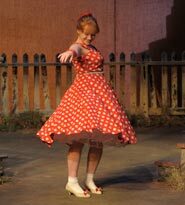 Check out the gallery on our website or like us on Facebook and see almost 40 other awesome phots from the play.